At Club Langley, we have three halls to choose from – the large Banqueting Hall with adjoining Garden Room and the more intimate smaller Function Bar. Both the hall and Function Bar have well-stocked bars and are fully air-conditioned. Each room has perfect areas for a DJ or live band and Bluetooth speakers available for background music if required. Our larger banqueting hall has a secluded garden and patio area plus the Garden Room for wedding ceremonies. We have disabled access, toilets and baby change. This hall can seat up to 180 guests or 350 standing if using the adjoining Garden Room. Our smaller hall, the Function Bar can cater for functions and wakes of up to 100 guests standing or up to 60 seated. To find out more and decide which is the perfect room for you, just go the left hand column and click on Banqueting Hall & Garden Room or Function Bar to see info and photos. 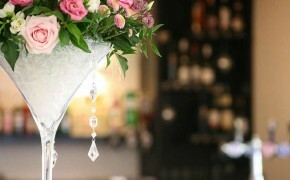 Club Langley is an ideal venue for weddings, parties, christenings, celebrations and wakes. Once upon a time we were just a hall with a bar. Things have moved on a long way since then. We are a fully licensed wedding venue and can hold your wedding ceremony and reception all under one roof in the purpose built Garden Room or outside under the pergola. We have three experienced Function Co-ordinators Amanda, Charlie and Nicole. We will help you plan and guide you through the difficult stages of preparing a wedding, and our Bar Managers will be with you on the day itself to look after guests and ensure it runs smoothly and our fully trained bar staff will keep the drinks flowing all night. **We are proud to announce we are the winners of the Bromley Business Awards 2012 in the ‘Hospitality & Leisure’ category along with our 2011 award winning recommended caterers. We also won the 2013 South London Business Awards for ‘Hospitality, Business, Hospitality & Leisure. We were awarded ‘Highly Commended’ in the 2013 Bromley Business Awards 2013. The venue is located close to the centre of leafy Beckenham in a quiet residential area. The Club is close to Eden Park railway station with its excellent links to the centre of London. We have ample car parking for clients and their guests. Our three dedicated Function Co-ordinators and Bar & Function Managers will ensure your celebration is the perfect event to remember. We can recommend caterers, provide table linen and chair covers, and suggest anyone from florists to DJs. All your decorating needs can be catered for from Elaine at Designer Bows who also provides sweet carts, bay trees, balloons, vase hire, table swags and so much more on request. To contact us please feel free to use our enquiry form. You can also call or email us using the information below.